Hobo's Hoard Video Slot Guide & Review - Casino Answers! Hobo’s Hoard is a 5-reel, 15-line video slot developed by Rival, featuring a wild symbol, scatter wins, multipliers, a free spins feature and a bonus game. You can play the Hobo’s Hoard video slot at Bovada. Coin sizes on the Hobo’s Hoard video slot are $0.01, $0.05, $0.10, $0.25, $0.50 and $1. 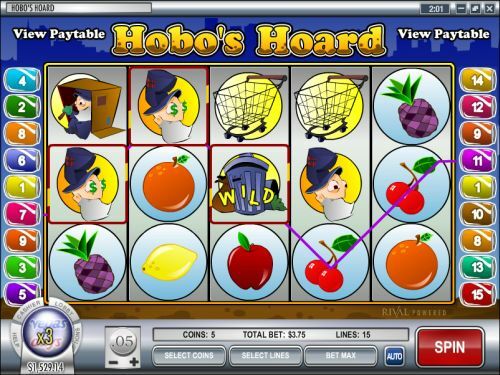 You can select from 1-15 paylines on the Hobo’s Hoard online slot game and play from 1-5 coins per line. You can bet as little as a penny per spin on the Hobo’s Hoard penny slot up to the maximum total bet of $75 per spin. Hobo’s Hoard has a good betting range that should suit most casino players, including casual players or high rollers. To play the Hobo’s Hoard video slot, select your bet and press the “Spin” button or you can use “Bet Max” to play all 15 lines at 5 coins per line. The Trash Can symbol is the highest paying symbol on the Hobo’s Hoard slot game. 5 Trash Can symbols on a selected payline will win you the 7500 coin top jackpot. The Trash Can symbol is wild and will substitute for all symbols except for scatter and bonus symbols. The Pop Can and People symbols are both scattered and will pay out 1X, 2X or 50X your total bet for 3, 4 or 5 symbols. 3 or more Scattered Pop Can symbols on the reels of Hobo’s Hoard and you will win 10 free spins with a 3X multiplier. All bets and lines played are the same as the game that started the feature. All wins pay left to right only, except for scatters (which pay any). Bonus wins are added to payline wins. Only the highest win is paid per selected line. Hobo’s Hoard has an autoplay mode available for real money players only. To access it, press the “Auto” button. You can play from 1-500 autoplay spins, stop when your balance increases/decreases by $1-1000, stop on any win and set a delay between spins of 0-10. You can stop the autoplay mode on the Hobo’s Hoard video slot at any time by pressing the “Stop” button. We weren’t expecting much from the Hobo’s Hoard video slot, but it does have a lot of special features to offer as well as a very good top payout that would certainly change this hobo’s lifestyle for the better. Presentation-wise, it isn’t on par with the best Rival has to offer, but it isn’t bad by any means. You can play the Hobo’s Hoard video slot for real money when you sign up and make a deposit at Bovada! Can USA players play the Hobo’s Hoard video slot for real money? No, American players are no longer allowed to play at Rival online casinos. Instead, we suggest you check out a Top Game casino like Bovada for all your online gambling needs. 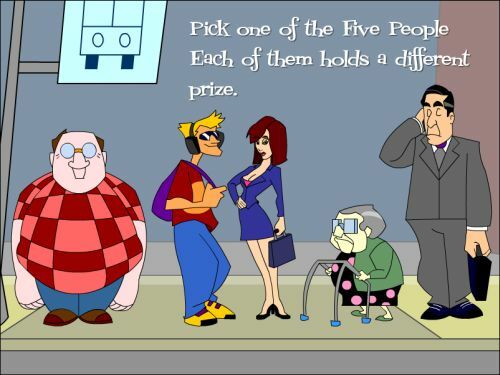 Where can I play a free Flash game of the Hobo’s Hoard online slot? You can find a Flash game of the Hobo’s Hoard video slot at Bovada. You can play for free or real money. If you have problems with the Instant Play casino, make sure you have the most up-to-date version of Adobe Flash Player.